Today, November 13, we celebrate the feast day of Saint Frances Xavier Cabrini (1850-1917), the first United States citizen to be canonized. She founded the Missionary Sisters of the Sacred Heart to care for poor children in schools and hospitals, and at the urging of Pope Leo XIII, moved to the United States to work among immigrants. Through her care for those who were struggling, hard work, and obedience, Saint Frances is regarded today as the Patron Saint of all immigrants. Frances Cabrini was born in Sant’Angelo Lodigiano (Lombardy, Italy). Born two months prematurely, Frances was small and weak, and struggled for survival. Frequently ill as a child, she would remain physically frail and susceptible to illness her entire life. Frances’ parents were farmers, and her mother stayed at home each day with the children. In total, her parents produced eleven children, with Frances being the tenth. Sadly, only four of the Cabrini children survived their childhood. Despite numerous losses and tragedies in the family, both Frances’ mother and father were strong in the Catholic faith, and through their teaching and example, Frances came to love God. One of her favorite activities was listening to her father read the stories of missionaries from the Annals of the Propagation of the faith. More than anything, from and early age and throughout her life, Frances desired to travel to China as a missionary. Again disappointed, but not discouraged, Frances returned to her home town, and began teaching in a private school, spending her non-work hours devoted to charitable works and serving the poor. She was immediately recognized for her gentle spirit, teaching ability, faith, and obedience, and over the next several years, was requested to move from school to school by the diocese, filling vacant positions and invigorating educational facilities. Eventually, she was requested to move to the town of Codogno, and assume direction of the girls’ orphanage there, known as the House of Providence. The diocese wished to restructure the facility into a religious institute, and realized that despite her frail health, Frances possessed the faith and spirit to accomplish the task. Without hesitation, Frances accepted, and within the year, the five young women who taught at the House, entered their novitiate with Frances as their novice mistress. In 1877, at the age of 27, Frances’ wish to take the veil was granted, and along with her five sisters, made her profession. In honor of Jesuit father Frances Xavier, Frances took the name Xavier, becoming Mother Frances Xavier Cabrini—as she would be known for the remainder of her life. Named superior of the community by her local bishop, she was encouraged to form a new religious institute. Along with the five sisters who took their vows with her, she founded the Institute of Missionaries of the Sacred Heart of Jesus in 1880. While some objected to the inclusion of the word “Missionaries” in the order’s name (as it implied overseas work, and the bishop intended that the sisters serve locally), Mother Cabrini was already thinking on a larger, grander scale. She had plans for her sisters to spread the Gospel beyond the borders of Lombardy. Mother Cabrini left Lombardy to travel to Rome, as was the custom at the time, seeking approval from the pope for her fledgling order. She also wished to establish a mission house in Rome, from which she could then use as a base for international missions. Surprisingly, despite the youth of the foundress and the relative newness of the order, she received papal approval and permission to open two missions in Rome. Mother Cabrini also met the founder of the Missionary Institute of Saint Charles, who was looking for a religious woman to assist him with ministering to Italian immigrants overseas—specifically in New York. He requested that she assist, but Mother Cabrini was reluctant. Her plans were to send her missionaries to China, as she had always dreamed. However, when presented with a letter from New York Archbishop Corrigan, formally inviting the Missionaries of the Sacred Heart to establish a house in New York, she was moved to request an audience with the pope. Ever obedient, and certain in the plan of the Lord, Mother Cabrini decided that she would do whatever Pope Leo XIII asked her to. She presented her dilemma to him, and following deliberation and conversation, he responded: “Not to the East, but to the West.” Disappointed, but not discouraged, Mother Cabrini and six of her sisters set out immediately for New York. Upon arrival, she was surprised to find that Archbishop Corrigan had not expected her so soon, and even more surprised when he suggested they return to Italy until he could prepare for her arrival. But Mother Cabrini answered, "Your excellency, the Pope sent me here and here I must stay." The archbishop admired her pioneer spirit, and so she and her sisters were permitted to begin their work. She and her companions spent the first night in a dingy tenement in the heart of the Italian ghetto. They could not sleep and stayed awake, tired, yet peacefully engaged in prayer. Soon afterwards, a local order, the Sisters of Charity, extended Mother Cabrini and her sisters hospitality and guided their first steps through the city. At once, the new sisters were faced with a language difference. Not speaking English, and being unfamiliar with the new countries customs, Mother Cabrini worked to establish her mission. She slowly gained the support of the Archbishop, eventually becoming dear friends. She secured the donation of a house for the Order, and soon thereafter, instituted an orphanage on the same property. A free school soon followed, all through donations and alms-gathering that the sisters undertook on a daily basis. Soon, based upon their good work—and the personal attention and spiritual direction they gave to each family in the Italian district—young women were requesting to join the order. Mother Cabrini returned to Italy, accompanied by her first North American postulants, who began their novitiate in Codogno. After an audience with her friend, Pope Leo XIII, she returned to New York, and embarked upon the institution of a larger orphanage. This site eventually included the North American novitiate of the order. Purchased at a low price, due to the lack of fresh water on the site, Mother Cabrini soon discovered a underground spring (some called it a miracle! ), which still provides water to this day. From New York, the Missionary Sisters branched out throughout America, starting in New Orleans (school and orphanage), and continuing west. It became clear—both in New York and other areas—that the immigrants were not receiving the medical care that they needed in public hospitals. However, Mother Cabrini was not particularly inclined to undertake this ministry. It was not until she had a dream of Our Blessed Mother that she changed her mind. 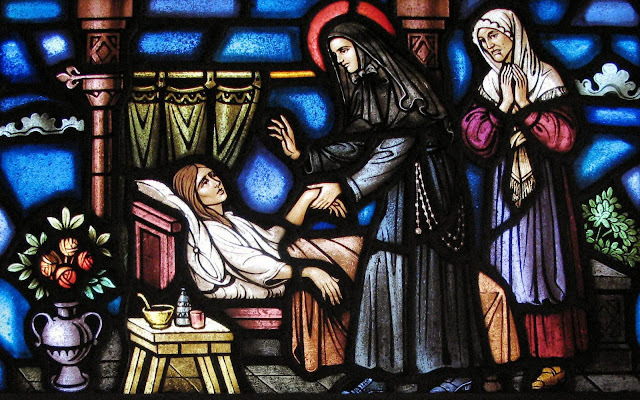 In her dream, Mother Cabrini saw Mary, the Mother of God, tending to a hospital patient. Asking Our Blessed Mother what she was doing, Mother Cabrini was surprised by her response: “I am doing the work you refuse to do.” Upon waking, Mother Cabrini moved quickly to establish a hospital for the Italian sick poor in New York City, and to her surprise, found herself to be a capable (even outstanding) healthcare provider and administrator. Hospitals were eventually established by the Missionary Sisters in Chicago and Seattle. The Missionary Sisters recount how the great faith of Mother Cabrini allowed this fast and miraculous growth of the order to occur. In Seattle, for example, as she was looking for a site to institute an orphanage, Mother Cabrini had a dream in which she saw a beautiful house on a hilltop. The next day she and some sisters were walking when she waved down a chauffeur-driven limo and asked for a ride. The lady in the limo was happy to help the sisters, and on the way, Mother Cabrini spoke of the house she had dreamed of. When they arrived at the convent and were saying goodbye, the lady told her: "Mother Cabrini, that house you dreamed of is mine, I own it. I never thought of parting with it, but if I may be allowed to enter your Holy House for a moment and receive a glass of water in the name of Our Lord, your little orphans shall have their home with my blessing." When asked later how she had obtained such a beautiful property, Mother Cabrini would say "I paid for it with three treasures: my love, a dream, and a glass of water in His Name." The Order had successfully established bases in three American cities, but Mother Cabrini was thinking bigger. She extended the Missionary Sisters work into Latin America, establishing schools in Nicaragua and Argentina. She established schools in Europe, including Paris, London, and Madrid. And she continued to work throughout the United States, including schools in Chicago, Scranton, and Newark. Based upon the needs of the Italian miners working in and around the Rocky Mountains, Mother Cabrini traveled to Denver and established schools, orphanages, and a mission center. While until that point her focus had been solely on Italian immigrants, the Missionary Sisters began to see the needs of other immigrant groups, extending their work to Mexican immigrants in California. Despite her failing health, Mother Cabrini traveled across the country (and the world! ), visiting each house, and personally establishing new locations. Her travels included: New York, Pennsylvania, Illinois, Louisiana, Colorado, California, Washington State, Central and South America and Europe. During this time, she fulfilled another personal goal, and became a citizen of the United States. Mother Cabrini began contemplating missions in Alaska, and still felt pulled toward Asia. However, the impact of her travels began to take its toll, and at the age of 67, she died in Chicago, in a private room at Columbus Hospital, as she was preparing Christmas candy for the local children. Less than 30 years later, she was canonized as a Saint—the first United States citizen to be canonized—by Pope Pius XII. Saint Frances Xavier Cabrini’s life was filled with disappointments… but she was never discouraged. Despite setbacks, weak health, and constant difficulty, the accomplishments of Mother Cabrini are remarkable. Ever humble, she took no credit, instead directing those who might compliment her work back to the Lord—to Jesus Christ—though which all things were (and are) accomplished. Throughout her life, Mother Cabrini found her strength in the Lord, and used every ounce given to her to serve others. We look to her today as a model of obedience, hope, service and strength. Mother Cabrini, pray for us!